Another choice for discussion regarding sustainability is food delivery services. I’m talking about meal delivery for at home preparation. Services such as Blue Apron and HelloFresh, Home Chef, etc. We have been receiving meal delivery services for about a year. 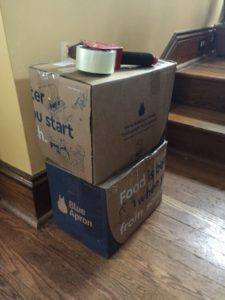 We use Blue Apron, and we’ve struggled a little bit with getting the right delivery size, the fact that we want to eliminate red meat without limiting meal variety, and with my sensitivity to tomato sauces and dried tomatoes. 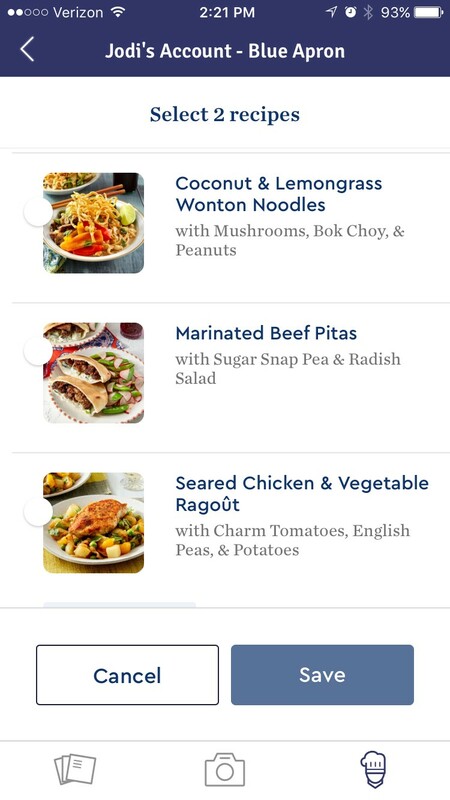 Blue Apron does not offer many ways to customize meals. All in all we have been very happy. We’ve stretched our range of weekly foods and included more vegetables in our lives. I love every vegetable known to mankind, but my husband and son, not so much. When we decide what to eat, the vegetables can sort of slip away from us, but when we receive meal delivery we eat what we get, no matter how many vegetables are in the package. I have recently read quite a bit about the wastefulness of meal delivery services, and seen questions about how these services cannot possibly be sustainable. I offer you my perspective. We are savings some money on food purchases. The meals cost just under $10 each, and we go to the grocery less. This means, quite frankly, that we buy fewer spur of the moment things. We waste much less as the delivery is portion appropriate. We did waste a bit when we were getting two meals for four people each week. With only three of us and one particularly resistant to WIDE variety, I was trying to eat several lunches of leftovers throughout the week, and getting tired of the food. We now get two meals for two people each week, and find I still have one reasonable lunch portion to take to work from each meal, unless the meal is burgers, and then, no leftovers. We eat healthier overall. The meals are from whole foods and prepared at home, with the exception of a few pre mixed spice packets. The meat, chicken and fish are from high-end farms and have been delicious. The range of vegetables, rices, noodles and seasoning has been beneficial to this family that can go weeks on bread and cheese (and chocolate milk) alone. The meals relate fairly well to seasonal availability of grown foods, which is really nice except when we get very tired of corn in everything come mid-September. We recycle, and Blue Apron helps us do it. The packaging is all recyclable. We let the freezer packs melt and dry thoroughly. We rinse out the plastic bottles and trays. We rinse the baggies. Each two weeks or so we put the silver bubble bags, freezer packs and all the containers back into the delivery box, print out the free and readily accessible mailing label from the Blue Apron recycling page, and set it on our front porch for the postal delivery worker to pick up and take away. We are able to recycle soft plastics (baggies) with the zips cut off via the NY State required plastic bag recycling bins at local groceries. If not, we could easily send those back to Blue Apron as well. The flavors are a bit redundant after a year. We are getting tired of some of the more common tastes in the meals, but we can select, each week, from eight different choices of meal and now have more control over what we get when. We can also easily take a break for several weeks whenever we like, with no penalty. My blood pressure went up! Blue Apron recipes say to add salt at nearly every step of the preparation, and I did. Oops, don’t do that. I add much less salt, now, and all is well. There is a lot of rice and bread and pasta, and these added carbs can become weighty in my diet. They also seem less local in origin. We need a staging area. In order to dry out the freezer bags and prep all to send back we need a place to hold this stuff for a couple of days or even a week or two after each delivery. If you cannot find this space, this process could be too difficult to manage. Delivery itself – not sure if this is sustainable. As this comes with UPS and we are in an urban environment, I suspect it works quite well though I have not done the carbon math to determine if it is or is not greener than going to the grocery a couple of times a week. I have read reviews of other meal delivery programs though I have not tried any others myself. It sounds like some do the recycling very well, and others do not. Some are complex recipes with much prep and some come with everything already cut and ready for the sauté pan. Some are more traditional meals with meat, side and veggie, and some lean more heavily on one-pan meals. Some are organic and some focus on seasonal while some have no seasonal variety at all. The key is to do your research and find the one that works for you, as well as try them out with the understanding that you may not benefit from meal delivery services at all. In the short-term, meal delivery services are a slightly less sustainable choice. This depends, of course, on which you select and where you live, etc. In the longer term, I see much value. The future of recycling will be returning the “waste” to the manufacturer or the vendor, and then the markets will shift as those manufacturers and vendors will have the magnitude of control needed to make that shift. They will be directly motivated to find ways to optimize and put any waste back into the materials system. In this regard the meal delivery services that do take back all the packaging are at the forefront of the market, and, over time, this will be a truly sustainable approach. Now the markets are in transition, and the efforts are sometimes unclear and unwieldy, and success depends entirely on the consumer’s care and efforts. If we lived in a rural town with limited deliveries already occurring, I think I would not go this route. This is a bit ironic, because then I would increase travel to the grocery, and now, even if I travel more to the grocery, it is a mere six block walk. In your circumstances, gage the tradeoff between delivery and shopping. The key point(s) for us have included less food waste and fewer silly extra purchases that tend to occur when we are strolling through our local store. What would happen if everyone did this? This is always my ultimate sustainability question, and there are always benefits and burdens. Let’s say everyone received home meal delivery once a week (two meals). The negative issues would be traffic of delivery vehicles and the packaging burden. The positive side includes good job creation and good economic influences. The groceries and restaurants would certainly still exist because this is for only two meals a week, not every meal. The biggest benefits? If the meal delivery service is fairly local and sources locally and/or based on seasonal foods, this would begin to educate society in these valuable, sustainable aspects of our foods. The biggest positive in the sustainability picture for meal delivery services? Our palettes will begin to expand away from processed foods. Anything that can break our ingrained American bias for highly processed pre-packaged foods will connect us more with natural food cycles, help us maintain our health, and begin, once again, to cherish food prep. I’ve never considered trying this because I assumed there would be quite a bit of waste. It would be great to find out what percentage of customers go through the process of returning the packaging. Thanks for your perspective! Thanks for the comment, Wendy. I truly appreciate it. I am not sure of the percentage of people who actually return the recyclables rather than just throw them out. I suspect until it becomes as easy to recycle as to waste, we will have a fight on our hands to improve. As some additional thought support, I received a link I think may be of interest. I am going to place it in this reply as well as link it inot my blog post. Check it out when you get a chance.